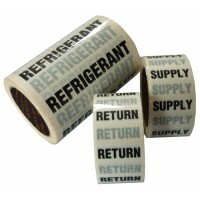 White Printed All Weather Pipe ID Tape- Campbell International Specialist Tapes. Our white with print pipeline identification tapes are BS1710 Supplementary Information and can be combined with the relevant outdoor coloured pipe identification tapes. Size: 48mm x 23m Colour: Black/White Technical Specification: White Polyester laminated with Linerless Transparent Polyester Excellent UV Protection. Resists most common oils, aliphatic solvents such as Heptan, Kerosene and alcohols when applied to impervious substrates. Suitable for use on a.. Size: 50mm x 23m Colour: Black/White Technical Specification: White Polyester laminated with Linerless Transparent Polyester Excellent UV Protection. Resists most common oils, aliphatic solvents such as Heptan, Kerosene and alcohols when applied to impervious substrates. Suitable for use on all pi.. Size: 48mm x 23m Colour: Silver/White Technical Specification: White Polyester laminated with Linerless Transparent Polyester Excellent UV Protection. Resists most common oils, aliphatic solvents such as Heptan, Kerosene and alcohols when applied to impervious substrates. Suitable for use on .. Size: 50mm x 23m	Colour: White 00E55	Technical Specification: White Polyester laminated with Linerless Transparent Polyester Excellent UV Protection. Resists most common oils, aliphatic solvents such as Heptan, Kerosene and alcohols when applied to impervious substrates. Suitable for use on all pip..